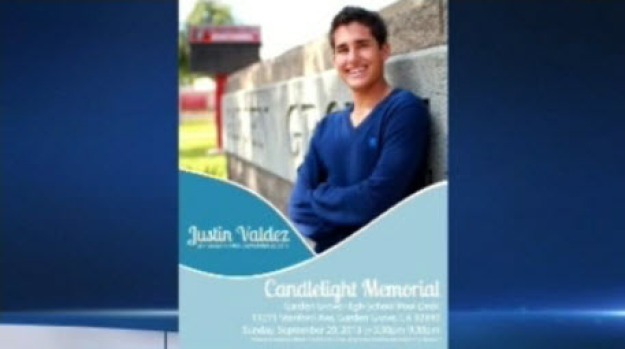 Justin Valdez, 20, was gunned down while getting off a Muni light-rail train Sept. 23, 2013, in San Francisco, where he was attending college. The suspect in a seemingly random fatal shooting in San Francisco's Ingleside Heights neighborhood on Monday had threatened others earlier in the evening, and appeared to be "hunting" for a victim, District Attorney George Gascon said Friday. Nikhom Thephakaysone, 30, allegedly held a gun to another man's back at a Muni stop near San Francisco State University earlier in the evening on the same day the murder of 20-year-old Justin Valdez occurred, Gascon said. He was also allegedly seen brandishing his .45 caliber semiautomatic handgun outside a Thai restaurant near the university, Gascon said. The victim in the first incident called 911 only after he had safely escaped onto a Muni vehicle and made it home, while the restaurant incident was reported right away, Gascon said. San Francisco police on Wednesday said they arrested a 30-year-old man after a Muni passenger and Southern California native was killed in an attack they are calling "random" and "unprovoked." Cheryl Hurd has the latest from San Francisco. Video footage taken from the M-Ocean View light-rail vehicle where the shooting occurred also shows Thephakaysone brandishing his gun several times on board, Gascon said. However, riders did not appear to take notice, even those in close proximity, Gascon said. Thephakaysone boarded the Muni M-Ocean View light-rail vehicle, behind Valdez, around 9:40 p.m. at 19th and Holloway streets near the university, prosecutors said. Police said the shooting appears to be random and unprovoked. Terry McSweeney reports. Police said the two men were both students at San Francisco State but did not appear to know each other, and did not interact on the train before the shooting. Thephakaysone allegedly pulled out his gun and fired around 9:50 p.m. as Valdez stepped off the train at Randolph and Bright streets, hitting him in the back. "This individual went out hunting, and Mr. Valdez was in the wrong place at the wrong time," said Gascon, who described the murder as "cold and calculating." Witnesses to the murder and surveillance footage helped lead police to Thephakaysone at his home in the 200 block of Lobos Street, where he lives with his mother, stepfather and sister, according to police. Police found two assault rifles there, as well as knives, survival gear and around $20,000 cash in Thephakaysone's possession. He faces charges of murder, assault in connection with an earlier incident, and possession of an illegal assault weapon. Thephakaysone appeared in court Friday, but arraignment was postponed to Oct. 2 at 9 a.m. He remains in custody and is being held without bail.